© AP Photo/Alex Brandon In this Wednesday, June 7, 2017 file photo, acting FBI Director Andrew McCabe appears before a Senate Intelligence Committee hearing about the Foreign Intelligence Surveillance Act, on Capitol Hill in Washington. FBI Deputy Director Andrew McCabe stepped down Monday, multiple sources familiar with the matter told NBC News. 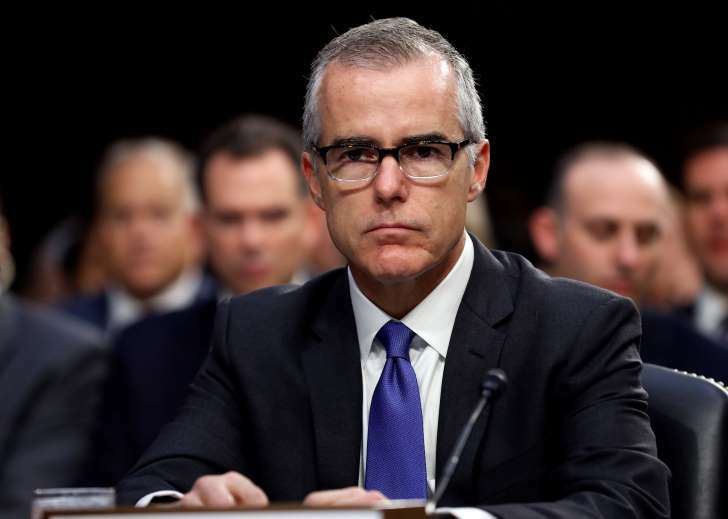 McCabe will remain on the FBI payroll until he is eligible to retire with full benefits in mid-March, the sources said. Earlier this month, the Washington Post reported that after Trump had fired FBI Director James Comey, he met with McCabe in the Oval Office and asked him whom he voted for in the 2016 election. Trump, the officials told The Post, also vented his anger at McCabe over hundreds of thousand dollars in donations that his wife, a Democrat, received for her failed 2015 Virginia state Senate bid from a political action committee controlled by a close friend of Hillary Clinton. A long-time career servant, McCabe had served at the FBI since 1996 under former directors Robert Mueller and Comey. In recent weeks, Trump has taken aim at McCabe, whose office first arranged the FBI’s interview with then-National Security Adviser Michael Flynn. Flynn was fired after just 24 days on the job and pleaded guilty last month to lying to the FBI and is cooperating with the Russia investigation. Trump has also repeatedly attacked McCabe on Twitter. “How can FBI Deputy Director Andrew McCabe, the man in charge, along with leakin’ James Comey, of the Phony Hillary Clinton investigation (including her 33,000 illegally deleted emails) be given $700,000 for wife’s campaign by Clinton Puppets during investigation?” Trump tweeted on Dec. 23. “FBI Deputy Director Andrew McCabe is racing the clock to retire with full benefits. 90 days to go?!! !” he added. Critics of Trump have characterized his attacks on the FBI as an effort to undermine the Russia investigation — and they began weighing in on McCabe’s departure just moments after news of it broke.